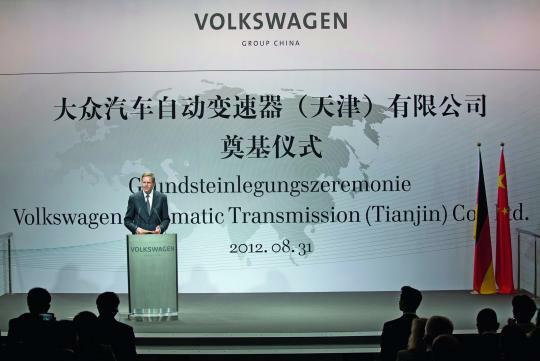 Volkswagen has laid the foundation stone for a new transmission plant in the northern city of Tianjin, China. The new plant, which will create 1,500 new jobs, is targeted to become operational at the end of 2014. The plant will have an annual capacity of 450,000 units. According to Volkswagen, the projected investment cost is �230 million in the first phase. �Our new transmission plant is further confirmation of the inseparable bond between China and Volkswagen," said Dr Jochem Heizmann, head of Volkswagen's China operations, at the founding stone ceremony. "Tianjin will become a cornerstone of our Chinese production network and a driving force for the economy in the entire region," he added. China is the biggest market for Volkswagen Group. The German auto maker sold 2.26 million units in the rising economic powerhouse, and has recorded a 17.1% increase in deliveries during the first seven months of 2012 despite a challenging economic outlook. 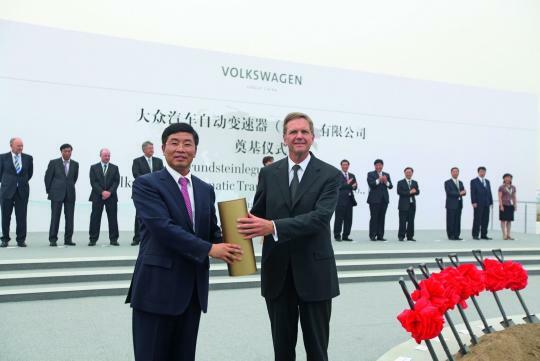 Volkswagen Group China is the largest and earliest international partner in China's automotive industry. The company step foot in China back in 1978 has established two joint ventures, namely Shanghai Volkswagen Automotive Co. Ltd and FAW-Volkswagen Automotive Company Ltd. These two joint ventures produce more than 20 Volkswagen, Skoda and Audi models. The founding stone ceremony in Tianjin was even graced by Philipp Roesler, Germany's minister of economics and technology. Perhaps, the tie between Volkswagen and China has gone beyond business dealings. He was travelling with Germany�s Chancellor, Angela Merkel, who visited Tianjin recently on the second leg of a two-day trip to China. Produce the 'famous' 7 speeds D.S.G..?Hmmm....Chinese made more problem.? ?